Posted 11/30/2017 5:24pm by Leslie Cooperband or Wes Jarrell. Things are quiet this week on the farm. The unseasonal warm weather is keeping the pasture green and lush. The goats are grazing and their milk production is holding steady; very unusual for this time of year. We're still making cheese (mostly chèvre and Huckleberry Blue). We're gearing up for the holiday season on and off the farm. Saturday, December 2nd, we will be attending Urbana’s Market in the Square from 8AM to 1 PM. In case you miss us at the market, we'll be open at the farm both Saturday and Sunday (1-4 pm each day). Angel Food: our little “crottin” style bloomy rind; small enough to eat in one sitting; great warmed with a drizzle of honey; perfect for your holiday cheese board. Moonglo: our raw-milk tomme-style cheese, aged for about 4 months. Semi-firm texture, fruity and sharp flavor notes. We’re using it in a sweet potato gratin for our thanksgiving holiday meal. Our farm store is open every weekend through December 17th. We have cheese, gelato, lots of pickled veggies, jams, meats, sausages, eggs, etc. We also encourage you to peruse our holiday farm store, now flush with unique gifts from several local artisans. We have LOTS of new PFFC “merch” to show you too!! Delight Flower Farm is taking reservations for their holiday wreaths, and they’re hosting a few wreath making workshops at the farm as well-mostly in December. If you missed our goat photo booth after Thanksgiving, no worries. We're hosting another one on Saturday, December 9th. Start a new holiday tradition; take your holiday pictures with our festively dressed goat friends. Through the holiday season, we continue to offer fresh, hand-rolled doughnuts from Lucky Pierre Bakers. In addition to our regular weekend hours, The Real Stand will be open the evenings (5-7 pm) before the Delight Flower Farm Wreath Making Workshops: December 7th and 13th. Pilgrims, Farmers and Survival, Holiday Markets and Re-opening of "The Real Stand"
Posted 11/16/2017 8:18pm by Leslie Cooperband or Wes Jarrell. As we approach the holiday of Thanksgiving, I have been thinking about the mythology around the pilgrims, their struggles to survive in a strange new land and their triumphant harvest feast. They arrived to the shores of the new world, buoyed by their ideology, but sorely lacking in basic survival skills. In reality, if not for the generosity and sympathy of the native peoples, the ill-equipped, pilgrim “city slickers” would have perished, and the holiday we know as “Thanksgiving” would not have become such a defining American tradition. The steepness of their learning curve, albeit with much starker life-or-death consequences, reminds me somewhat of my own path from urban academic to mostly self-sufficient farmer, living and eating pretty close to the land. I came to farming flush with my own ideologies but lacking much experience (save for a few home vegetable gardens). I was very good at preaching the gospel of sustainable agriculture to other farmers, but I had never tried to walk the path of my own advice. Our early days as a goat farmers were full of tension and naiveté. Our inexperience was so grave that we didn’t even realize that two of our does were pregnant until one of them gave birth to a baby buckling the Monday after Thanksgiving. While local grocery stores and farmers’ markets had my back as I learned from novice farmer failures, I felt a deep and humbling appreciation of eating foods I helped to grow or raise with my own hands. Nowadays, not only do we grow and raise a lot of our own food, we have forged relationships with like-minded farmers, making it easy to prepare a true feast from foods grown in our farming “backyard.” We now have our own “thanksgiving” traditions: grilling a Bane-Family Meats pasture-raised turkey on our wood fired-grill, preparing delicious organic veggies from our farmer friends at Blue Moon Farm, scoring local mushrooms and heirloom cornmeal for the stuffing, toasting southern IL pecans for the pecan pie and using our very own chevre for the pumpkin cheesecake. We celebrate our connection to the land and to the other farmers who share our ideals for meaningful stewardship. Eating close to the ground has become easy for us, second nature. With so many amazing dedicated farmers growing beautiful foods for your holiday tables, it is easy for non-farmers to eat close to their own ground too. Happy Thanksgiving! Saturday, November 18th, we will be attending Urbana’s Market in the Square from 8AM to 1 PM. This is THE big pre-Thanksgiving Holiday market, and it’s the best time to get almost everything you need for your festive meal—veggies, a local turkey (especially if you pre-ordered), fruits, sweets and of course, our cheese and gelato. We’ve made a special chevre flavor the holiday: a fresh chevre with pickled Barcelona pepper sauce. We grew these prolific peppers (slight heat, but really pretty mild) and Sarah (our gelato maker) fermented them with salt and the pureed them into a lovely sauce. The consistency reminds me of a chimichurri if you’re familiar with that Argentine accompaniment. Sarah is also making our famous spiced pecans (with Voss Orchard Pecans, Carlyle IL) to accompany all of our cheeses on your holiday cheese board. Our farm store reopens on Sunday, November 19th, 1-4 pm. You can pick up pre-ordered pasture-raised turkeys from Bane Family Meats and grab any last minute needs for the Thanksgiving Holiday. David Bane has informed me that his turkeys are now sold out. We’ll have cheese, gelato, lots of pickled veggies, jams, eggs, etc. You’ll also get to peruse our holiday farm store, now flush with unique gifts from several local artisans. We have LOTS of new PFFC “merch” to show you!! Delight Flower Farm will be taking reservations for their holiday wreaths, and they’re hosting a few wreath making workshops at the farm as well-mostly in December. Our “grand” launch of our seasonal holiday market will be Saturday, November 25th, 1-4 pm. The goat photo booth returns (yes, we dress up some of our goats in holiday attire, and yes, you can take your holiday pictures with them) as well as fresh doughnuts from Lucky Pierre Bakers. We will also be open Sunday, November 26, 1-4 pm (but no goat photo booth) in case you can’t make it on Saturday. Thereafter, The Real Stand will be open Saturdays and Sundays, 1-4 pm through December 17th. We will also be open the evenings (5-7 pm) before the Delight Flower Farm Wreath Making Workshops: December 7th and 13th. Posted 11/10/2017 12:16pm by Leslie Cooperband or Wes Jarrell. A bunch of farmers went to Washington (DC) this week. The National Sustainable Agriculture Coalition (NSAC) invited farmers from states around the nation to “fly in” for less than 24 hours and meet with our states’ representatives in the congress and senate to discuss issues related to the 2018 Farm Bill. Many would consider us atypical farmers: goat dairy and micro-cow dairy farmers, organic fruit and vegetable farmers, specialty grain farmers and beekeepers. Our voice and influence in policy matters that shape the farm bill are more like a whisper in a hurricane than a fog-horn in a sea storm. Most of us are not direct beneficiaries of the federal programs that comprise the farm bill, yet all of us care deeply about land stewardship, rebuilding rural communities and providing safe and healthy food to our citizens. After landing at the airport, we were whisked away to the NSAC office to review the policy issues and practice how to converse with congress folks and their staffers. The dance of influence and policy making is quite prescribed. There are patterns of expectation: superficial pleasantries, telling our farm stories and, in conclusion, “the ask.” Our “asks” are relative droplets of water in a sea of programs that keep our current agricultural system a float—funds for conservation, funds for research in sustainable agriculture, funds to promote farmers’ markets and access to fresh, local foods. It is easy to advocate for these things because they seem so fundamental to the way all of us farm. Nonetheless, we are told that our point of view is not frequently told. The next day, it is off to the races, with back-to-back meetings scheduled with several House representatives and Senate staffers. We farmers are dressed in what we consider our “important meeting” finest. Yet, even our attire sets us apart: “fancy farm flannel” in a sea of “suits.” As we walk the halls of congress, there is a constant stream of constituents coming and going. I am impressed with the number of people who come to Washington to ask for something. For some members of congress, we are there to remind them that we are their constituents too (as well as the farmers represented by large trade or commodity organizations); we are there to interject our little voices into the constant chatter from the big Ag boys and their lobbyists. For others, we are there to applaud the good work they are already doing on our behalf, and encourage them to put a little more in the kitty of sustainable agriculture. The day passes quickly. The stories and the “ask” pitches become refined as the meetings progress. I confess that the attempts to influence can be heady; especially when it seems that the folks on the other side of the table take notes and actually look you in the eye. Our confidence builds. It becomes easy to believe we are more like actors in “Mr. Smith Goes to Washington” (naïve and hopeful) than those in “Thank you for Smoking” (scheming and cynical). The day comes to a close, the sun sets over the Potomac and we get on our planes to head back to the chores awaiting us back home. After several years of construction upheaval, the Olympian Drive-Lincoln Avenue road project is now completed. Local politicians cut the ribbon on Monday, opening the southern intersection of Olympian Drive and North Lincoln Ave. It is NOW VERY easy to get to our farm from all directions. HOORAY!! Angel Food: our little “crottin” style bloomy rind; small enough to eat in one sitting; great warmed with a drizzle of honey. I’d buy two if I were you. Moonglo: our raw-milk tomme-style cheese, aged for about 4 months. Semi-firm texture, fruity and sharp flavor notes. Perfect with sliced apples. Gelato Pint Flavors: At the farm or at the market, take advantage of our “three pint special”: buy 3, get $3 off the total price! Our farm store, The Real Stand, is temporarily closed as we get ready for the holiday season. We will reopen on Sunday, November 19th, 1-4 pm. You can pick up pre-ordered pasture-raised turkeys from Bane Family Meats and pick up any last minute needs for the Thanksgiving Holiday. The turkey size range will be from 12-25 lbs., and the price is $4.00/lb. Orders will be taken by phone (217-722-2188) or by email (davidpbane@aol.com) until they are sold out. Our “grand” launch of our seasonal holiday market will be Saturday, November 25th, 1-4 pm. The goat photo booth returns (yes, we dress up some of our goats in holiday attire, and yes, you can take your holiday pictures with them) as well as fresh doughnuts from Lucky Pierre Bakers. We’re super excited about the local artisans’ fare that will be represented in the Real Stand this season. Delight Flower Farm will be taking reservations for their holiday wreaths, and they’re hosting a few wreath making workshops at the farm as well. Stay tuned for more details next week. Posted 11/2/2017 1:17pm by Leslie Cooperband or Wes Jarrell. Laundry’s getting done. Soup is being made. Thoughts about reading books are allowed to emerge. First frost; check; leaves changing, falling; check. Cold, damp air hovers over barns, cuts through Carhart jacket. Daylight savings falling off the calendar this weekend, early darkness is just around the corner. Bald chickens molting drop their egg production; waiting for artificial light and a regrowth of feathers to keep them warm. The slow creep toward the end of another season is on. Newly pregnant does are shutting off the tap of milk. Milk volumes in the bulk tanks are shrinking, while the butterfat and milk protein concentrations soar. The seasonal tug of war between work and not work has begun. Do we keep the does going, milk them twice a day, make a few more batches of cheese? Or, do we go to once/day milking, let nature take her course, dry herself off, let rest overtake her. The latter is oh so tempting, but the drive to stock the cheese cupboard for winter aging will probably prevail. The final outdoor Market at the Square (7 AM to 12 noon) is Saturday, November 4th. Compared with last weekend, outdoor temps are forecast to be down-right balmy (high 50’s). It might be a bit wet, but don’t let the rain slow you down. There is still A LOT of great food to be had, and most of it goes great with our cheeses. DON'T FORGET--MARKET IN THE SQUARE STARTS ON 11/11 (8 am-1 pm) ,AND WE WILL BE MOVING INSIDE LINCOLN SQUARE MALL through end of December. Black Goat: our ash-coated bloomy with a hint of yeast on the rind; try our ACS award winning cheese. Perfectly ripe—THESE ARE THE FINAL ROUNDS OF THE SEASON!! Goat Milk Yogurt: Available in both pints and quarts-LAST of the SEASON!! Gelato Pint Flavors: Take advantage of our “three pint special”: buy 3, get $3 off the total price! Our cheese pairings class is sold out! Our farm store, The Real Stand, is temporarily closed as we get ready for the holiday season. We will reopen on Sunday, November 19th, 1-4 pm. You can pick up pre-ordered pasture-raised turkeys from Bane Family Meats and pick up any last minute needs for the Thanksgiving Holiday. The turkey size range will be from 12-25 lbs., and the price is $4.00/lb. Orders will be taken by phone (217-722-2188) or by email (davidpbane@aol.com) until they are sold out. Our “grand” launch of our seasonal holiday market will be Saturday, November 25th, 1-4 pm. The goat photo booth returns (yes, we dress up some of our goats in holiday attire, and yes, you can take your holiday pictures with them) as well as fresh doughnuts from Lucky Pierre Bakers. Stay tuned for details. Posted 10/26/2017 6:49pm by Leslie Cooperband or Wes Jarrell. We pride ourselves in composting all the organic wastes generated on the farm—the animal manure, deceased animals, prunings and kitchen waste. We often feed our animals treats from the gardens or the kitchen—discarded flowers and kale stems are especially prized by our goats. While I frequently throw green weeds over the fence to our laying hens, I hadn’t really considered them appreciative of food scraps. Their excitement over burdock leaves and pigweed stems suggested kitchen wastes might delight them. Most folks not familiar with the ways of fowl believe they are vegetarians. Nothing could be further from the truth. I chuckle at the labels on egg cartons claiming “fed only a vegetarian diet.” Chickens are omnivores, just like us. They fight like “hens” when unearthing prized beetles or worms in their yard. The more varied their diet, in fact, the more healthful and delicious their eggs. So, sometime this summer, we started giving them buckets and buckets of food scraps from the kitchen—watermelon rinds, peach skins and pits, potato peelings, polenta, slightly rotten tomatoes—their appetites seemed insatiable. We would spread 5-gallon buckets full of food waste onto their yard, thinking it would take days to work through the heap. To our amazement, they would go to work immediately; the rhythm of scratch, tug and tear mesmerizing. Their efficiency and thoroughness are inspiring. The thread-bare skeleton watermelon shells are a testament to the power of the chicken gut. Time to move over compost microbes; there’s a competitor recycler in your midst. We have decided to “stay home” this coming Saturday and host market patrons at the farm. We’ll be open from 9 AM to 4 PM. We will return to the outdoor market on Saturday, November 4th, for the last outdoor market, and then we will move inside to the “Market in the Square” thereafter. We feel so decadent, skipping out on near freezing temperatures forecast for this Saturday, but we thought our market patrons might like to experience a cozy fall Saturday morning in the warmth of our barn. To make it extra special, we will have doughnuts from Lucky Pierre Bakers (these are HUGE, delicious doughnuts fried in clarified butter!!! ), and we’ll make some espresso drinks to warm you up (espresso, café Cubano, café Americano, cappuccino, affogato). If you dress up in Halloween costume (adults and kids a like), we’re offering trick or treats too (yes, that means CANDY). Don't forget to follow directions to the farm from our website. This will ensure easy travels during the road construction on N. Lincoln Avenue. The detour is in effect until November 6th. We’re running a special on remaining pumpkins, gourds and squashes from The Great Pumpkin Patch in Arthur--50% off! You can cook with them or just use them as decorations. They are gorgeous and quirky (and delicious). You can also visit with the goats, and enjoy the fall foliage in the countryside. Angel Food: our little “crottin” style bloomy rind; small enough to eat in one sitting; this cheese is perfectly ripe right now. I’d buy two if I were you. Since our market is at the farm this weekend, we are also serving gelato by the scoop!! Farm Open Hours: In addition to our special Halloween market at the farm, we will be open on Sunday the 29th of October too--1-4 PM. Then, we will be close the Real Stand temporarily in November to get it ready for the holidays. We will re-open the Sunday before Thanksgiving, so that folks who might have missed the holiday Market in the Square on Saturday, the 18th can have a chance to purchase cheese, gelato and other farm treats. David Bane, of Bane Family Meats is offering his pastured “broad-breasted bronze” turkeys for sale at our farm this year. You must pre-order and then pick up at our farm on Sunday, Nov. 19th 1-3 pm. Here are the details: All turkeys have been raised on pasture with no antibiotics, no GMO's and no pesticides on Bane Family Farm. The size range will be from 12-25 lbs., and the price is $4.00/lb. Orders will be taken by phone (217-722-2188) or by email (davidpbane@aol.com) until we are sold out. Learn something new! Take our Cheese Pairings Class on Sunday afternoon (1-3 pm), November 5th—we will wow you with lots of styles of cheese and lots of accompaniments –jams, honey, pickles, wines, beers. We’ll cover a few basic concepts about cheese styles and how to use all your senses to appreciate the dizzying array of flavors and textures. Then, we’ll dive in head first to a fun-filled afternoon of flavor sensations. $35 ticket covers everything (limited to 30 participants, so don’t delay in signing up). Posted 10/19/2017 9:39pm by Leslie Cooperband or Wes Jarrell. Typically, by this time of year, we’ve had our first frost. Yes, the nights are cooler, yes, the air forms crispness in my nostrils, but the days of late October are drenched in warm sunlight. The neglected vegetable garden still holds richly sweet tomatoes and peppers for those willing to pick them. The stately maple’s leaves have barely begun to turn yellow at the very tip of the tree’s crown. The farm almost feels like it’s in suspended animation; a holding pattern hovering above the bridge between late summer and fall. Normally, there’s a sense of urgency. Normally, we check the forecast for threats of nightly lows dipping into the low thirties. The threat sends us scrambling to collect the last tomatoes clinging to the vines, green ones and all. Interestingly, we are complacent and even disinterested in harvesting them when there is no threat of frost. It feels strange not to have an impending dip below the freezing line any time soon. There’s decadence to the absence of urgency. 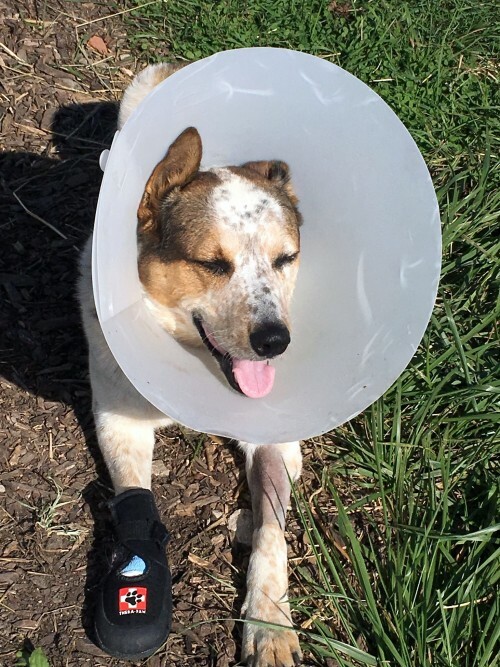 He is a terrible patient, and it’s hard to follow the vet’s instructions of limited activity. So, I take him on little strolls around the farm to check on the goats. They are alarmed by his head cone. Lentil, one of our breeding bucks, sounds the alarm with a snort, and the does retreat behind him. The doelings and retired does peer at him over the fence, not sure that there’s the dog they know at the base of the white cone. Blue, meanwhile, is oblivious to their concerns, laying peacefully in the dirt, soaking up the warmth of the fall sun. Farmers’ Market Offerings: We’ll be attending the Urbana Market at the Square this Saturday, October 21st. Please come visit the market and get some of the bountiful produce before a frost really does come. We are still quite flush with cheese and gelato. We have a special flavor of chevre this week: chevre with roasted poblano peppers. The peppers have a very mild heat, and they complement the creaminess of the chevre. Gelato: For some strange reason, people don’t seem to buy gelato in the fall. For me, any season is gelato season, even in the depths of winter. Why not take advantage of our “three pint special”: buy 3, get $3 off the total price! Farm Open Hours: We are open only on the weekends through the end of October (Saturdays and Sundays, 1-4 PM). We will be closing the Real Stand temporarily in November to get it ready for the holidays. We will re-open the Sunday before Thanksgiving, so that folks who might have missed the holiday market on Saturday, the 18th can have a chance to purchase cheese, gelato and other farm treats. Here are the details: "All turkeys have been raised on pasture with no antibiotics, no GMO's and no pesticides on Bane Family Farm. The size range will be from 12-25 lbs, and the price is $4.00/lb. Orders will be taken by phone (217-722-2188) or by email (davidpbane@aol.com) until we are sold out. " In the meantime, The Real Stand is open for business this weekend, offering cheese, gelato, meats, eggs and other farm products through the end of this month. Check out our fall offerings: pumpkins, gourds and squashes from The Great Pumpkin Patch in Arthur! You can cook with them or just use them as decorations. They are gorgeous and quirky (and delicious). Learn something new! Take our Cheese Pairings Class on Sunday, November 5th—we will wow you with lots of styles of cheese and lots of accompaniments –jams, honey, pickles, wines, beers. We’ll cover a few basic concepts about cheese styles and how to use all your senses to appreciate what you are tasting. Then, we’ll dive in head first to a fun-filled afternoon of flavor sensations. $35 covers everything (limited to 30 participants, so don’t delay in signing up). LAST CHANCE: If you can’t leave the city for the farm, why not bring the farm to the city? The Café at Local Foods Grocers in Chicago is crafting a five-course meal featuring many of the products raised on our farm. The event will be held at Local Foods on Saturday, October 21st. The menu is sublime, and they even have optional wine pairings. Here’s the link to their Eventbrite page where you can make reservations. Posted 10/12/2017 7:02pm by Leslie Cooperband or Wes Jarrell. Dust to mud in under seven days; this week’s theme for the farm. I welcome the soggy ground underfoot. The psychedelic green has returned to our lawn, while our neighbor’s newly planted wheat crop is lapping up the soil moisture, a mat of crew-cut shiny shoots to show for their thirst. Following a night or two of deluge, we’ve been pelleted by a fine mist over the past few days. The sky tries to clear itself, only to become shrouded in a low-hanging grey blanket a new. The blanket spits at us annoyingly. The skid steer moving heavy bales of bailage leaves muddy tracks in its wake; mud that will make its way onto goat hooves and dog paws, mud that will seek out the clean floors of our log house. The leaves are still mostly green on the trees, ignoring any autumnal cues, believing the unseasonably warm temperatures instead. The gusty rain blows them onto the concrete slab in front of our barn, leaving a stained imprint of fading summer as I brush them away. Gelato: take home a few pints this week (try our “three pint market special: buy 3, get $3 off the total price! Farm Open Hours: We are open only on the weekends through the end of October (Saturdays and Sundays, 1-4 PM). We will be closing the Real Stand temporarily in November to get it ready for the holidays. We will re-open the Saturday after Thanksgiving. In the meantime, The Real Stand is open for business, offering cheese, gelato, meats, eggs and other farm products through the end of this month. Check out our fall offerings: pumpkins, gourds and squashes from The Great Pumpkin Patch in Arthur! You can cook with them or just use them as decorations. They are gorgeous and quirky (and delicious). JUST POSTED: Learn something new! Take our Cheese Pairings Class on Sunday, November 5th—we will wow you with lots of styles of cheese and lots of accompaniments –jams, honey, pickles, wines, beers. We’ll cover a few basic concepts about cheese styles and how to use all your senses to appreciate what you are tasting. Then, we’ll dive in head first to a fun-filled afternoon of flavor sensations. $35 covers everything (limited to 30 participants, so don’t delay in signing up). Farm Dinners: There are a few tickets to both seatings of the October 14th “Pizza Night Out” dinner. Grab while they last. CANCELLED—WE ARE SORRY TO ANNOUNCE THAT BRUNCH ON THE STAGE AT THE VIRGINIA THEATRE IS CANCELLED. WE APOLOGIZE TO THOSE OF YOU WHO HAVE ALREADY PURCHASED TICKETS—YOU WILL BE REFUNDED BY THE VIRGINIA THEATRE. WE’LL TRY AGAIN NEXT YEAR TO OFFER THIS EVENT. Brunch on the Stage at the Virginia Theatre—SUNDAY OCTOBER 15TH. If you can’t leave the city for the farm, why not bring the farm to the city? The Café at Local Foods Grocers in Chicago is crafting a five-course meal featuring many of the products raised on our farm. The event will be held at Local Foods on Saturday, October 21st. The menu is sublime, and they even have optional wine pairings. Here’s the link to their Eventbrite page where you can make reservations. Posted 10/5/2017 10:18pm by Leslie Cooperband or Wes Jarrell. The planned chaos that is breeding season is in full swing at the farm. This year’s nuptial arrangements are a bit complicated. We have four breeding groups—the two Nubian bucks, Nate and Rik, have a dozen or so partners each, while the two La Mancha bucks-BJ (our new guy from Iowa) and Lentil have somewhere between 12-25 betrotheds. We also have a group of retiring does still in milk who are not being bred. Normally, the kid barn is spared from the mayhem of goat mating rituals, but the doe barn just isn’t big enough to handle all these groups. Milking and feeding chores now take almost twice as long as normal. Moving groups to and from their breeding pens without “incident” is a gift. Invariably, a doe in heat decides she’d rather be with a buck other than her chosen one, making a beeline for the lusty boy, instead of sauntering up the ramp to the milking parlor. While they’re being escorted to and from the kid barn, if there’s a chink in the “armor” keeping does from a grain bin, they will find it. In an attempt to minimize confusion and monitor the progression of breeding, we’ve given each buck a breeding harness, complete with a marking crayon. The crayon is inserted into a holder on the chest so that when the buck mounts the doe, he leaves a color marking on her back side. Each caprine cassanova has a different color-orange for BJ, green for Lentil, blue for Nate and yellow for Rik. Lentil, in his first season as a breeder, has been a busy boy, based on the number of green-butted does in his pen. I’ve caught him napping soundly on a couple of afternoons this week (his slumber was so sound, I actually had to check to make sure he was breathing); no doubt exhausted from his single-minded job. Not only can we track how productive each buck has been, the colors let us know who has been with whom. If a sneaky doe ends up with an unintended partner, her backside color will be betray her dalliance. Girls being girls, especially girls in heat, the color markings don’t always stay where they first land. We seem to have a lot of blue-faced goats making their way to the milking parlor. Farmers’ Market Offerings: We’ll be attending the Urbana Market at the Square this Saturday, October 7th. This is the last week for dried tomato chevre-it’s now or never. All flavors of chevre can be frozen for enjoyment later. Farm Open Hours: We are now open only on the weekends (Saturdays and Sundays, 1-4 PM). We know that fall is a busy time, with kids back in school and work demands beckoning. If you need a little break from the hustle and bustle, come out to the farm. It can be a very tranquil place in the early fall. There are still lots of things growing, and the goats love visitors any time of the year. The Real Stand is open for business, offering cheese, gelato, meats, eggs and other farm products. Check out our fall offerings: pumpkins and squashes from The Great Pumpkin Patch in Arthur! We also have a few of their gorgeous potted mums. Fall Festival: Come out to the farm this Sunday, October 8th (3-6 pm)—hay rides, cider pressing, cider drinking, light snacks, including a special appearance by Lucky Pierre bakers-doughnuts and muffins. You can find all the details on our Facebook events page. We are planning to offer several classes and workshops later this fall (November)—cheese pairings with wine and beer and demystifying cheese for sure. Stay tuned for details and dates. Farm Dinners: Tickets to both seatings of the October 14th “Pizza Night Out” dinner are still available but they’re going FAST. Brunch on the Stage at the Virginia Theatre—SUNDAY OCTOBER 15TH. We’re so excited to partner up with the Virginia to offer a farm to table brunch, complete with music by Sam Payne and select readings by yours truly. There’s not much time to sign up, and seating is limited, so check out the menu and book your reservations now. You’ll also get a behind the scenes tour of the historic theatre. You can also just go directly to their ticket purchasing page. Posted 9/29/2017 9:27am by Leslie Cooperband or Wes Jarrell. With a light puff of air from the weather gods, the mercury on the thermostat slide downward to autumnal “normal” this week. There was no great front that came through. There were no thunder clouds or turbulent air currents; just a little tweak on the atmospheric thermostat dial. While we welcomed the crisp chill in the air, we had hoped for a little rain from the changeover. The gentle but sudden transformation aligned the “stars” of fall with immediate effect. On our daily walk to the prairie, the goats’ gustatory fixations turned to dried cottonwood leaves, scarfing them up like junk food junkies on a potato chip binge. The crackling communal munching was music to my ears. On their way to the prairie, the girls must pass by the buck pen. This gives us a chance to see who is in heat. The bucks, ever vigilant, patrol the perimeter, snorting and calling to whomever of the ladies that will pay them attention. Their pacing is so persistent that they have worn a path in the pasture paddock. The does in heat saddle up to the fence and taunt the boys with tail wags-goat flirting is a sure sign that they are in heat. There has been a lot of flirting going on in the past couple of days. Today, we will clean out the doe barn and set up the breeding pens. Next Monday, the bucks will finally get to satisfy their needs and fulfill their fall duties. Pumpkins are another sure sign that the stars of fall are aligned. Yesterday, I made my annual pilgrimage to The Great Pumpkin Patch in Arthur, IL to fill up the back of my station wagon with the bizarre and beautiful members of the Cucurbitaceae family-one of the most diverse plant families on the planet. I always marvel at the showy array of colors, sizes and shapes of so many squashes, pumpkins and gourds. They are genetic selection on steroids. Pumpkins and squashes for every purpose-roasting, baking, seeds and yes carving. We have a small selection of these beauties for sale at our farm store this weekend and next. Farmers’ Market Offerings: We’ll be attending the Urbana Market at the Square this Saturday, September 30th. We still have our special dried tomato chevre, but it won’t be around for too much longer. If you love this cheese as much as I do, I would recommend stocking up. All flavors of chevre can be frozen for enjoyment later. All three bloomy rind cheeses are back in the line-up, but feta is gone for a while. Farm Open Hours: Please note that we shortened our open hours for the month of September. We are now open only on the weekends (Saturdays and Sundays, 1-4 PM). We know that fall is a busy time, with kids back in school and work demands beckoning. If you need a little break from the hustle and bustle, come out to the farm. It can be a very tranquil place in the early fall. There are still lots of things growing, and the goats love visitors any time of the year. The Real Stand is open for business, offering cheese, gelato, meats, eggs and other farm products. NEW THIS WEEKEND: pumpkins and squashes from The Great Pumpkin Patch in Arthur! We also have a few of their gorgeous potted mums. Fall Festival: With the weather finally acting like it should, we’re in a mood to celebrate the season. 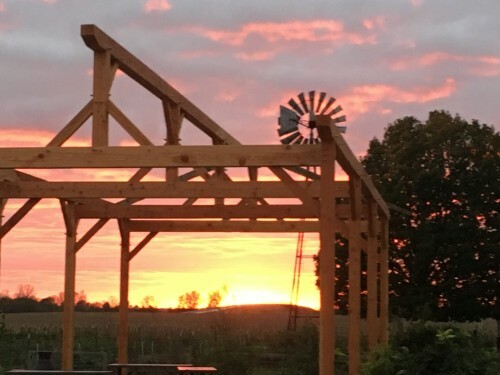 Come out to the farm on Sunday, October 8th (3-6 pm)—hay rides, cider pressing, cider drinking, light snacks, including a special appearance by Lucky Pierre bakers-doughnuts and muffins. SAVE THE DATE. We are planning to offer several classes and workshops later this fall (November)—cheese pairings with wine and beer and demystifying cheese for sure. We might even offer another all-day cheese-making workshop. Stay tuned for details and dates. Farm Dinners: We still have tickets available for the “Celebration of Squash” farm dinner from guest chef Nicole Pederson (Found Kitchen). The dinner is TOMORROW night, so it’s now or never. Although the meal features many members of the Cucurbitaceae plant family, it is not vegetarian. Check out the menu. We also have tickets to both seatings of the October 14th “Pizza Night Out” dinners-more casual fare. Check them out too. Posted 9/21/2017 6:33pm by Leslie Cooperband or Wes Jarrell. If there is any theme to the rhythm of the seasons this year, it would be discord. It would be unpredictable. It would be set no expectations. The cool, dry clarity of august set up expectations for fall; the fall of Midwest past: goats cycling into breeding heat, apples falling from the trees, soybean fields a blaze in rust and gold hues, market shoppers talking about soups they plan to make rather than salads. Early September was following the script. Then, early this week, thunder clouds rolled in, dumped nearly two inches of rain onto our cracked parched soils and cranked up the atmospheric thermostat to summer doldrums 90’s with heat index close to 100. It was not a fleeting flare up either; this heat wave is settling in for a while. The abrupt change is jarring, especially on the eve of the autumnal equinox. Autumn used to mean sweaters at sunset, not tank tops. Goat coats should be growing not shedding. Tomatoes should be slowing their ripening, giving the fall greens a chance to take center stage. Nature is confused, and farmers must acquiesce. So, while we watch the combines start to roll in senescent cornfields, I will be imagining the farmers’ gratefulness for air conditioned tractor cabs. New arrivals at the farm A fellow farmstead goat creamery and dear friend of mine in Iowa has decided to call it quits. She made beautiful little robiola-style cheeses and milked a handful of spoiled La Mancha goats. When she notified me that she had made the very hard decision to stop, she asked if we would take some/most of her tiny herd (she was only milking about 12-15 goats, but, boy, are they great milkers). How could I say no? I knew her herd fairly well; I knew she treated her girls like princesses, and they gave back to her in copious quantities of lovely la mancha milk. So, last weekend, Erica (our herd manager) and her fiancé hitched up the trailer once again for a little road trip to Iowa-this time to get goats, not sell goats. They arrived back at the farm with the precious cargo on Sunday afternoon. The new arrivals are slowly adjusting to their new environs. When I enter the kid barn, and the doelings start screaming, they greenhorns look at me bewilderedly, “how did I end up here” is written all over their faces. 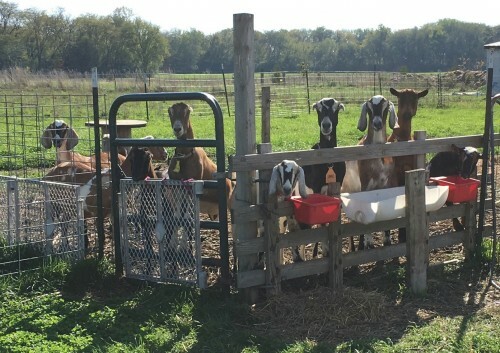 Our friend had warned us that a couple of them were particularly spoiled (I’m putting a few on goat weight watchers), and they’re exhibiting full goat will power on the milk stand. Soon enough, with Erica’s gentle (but firm) hand, they will get used to their new routine. For now, we pet them a lot, bring them low-calorie treats and reassure them that their new home is a good one. Farmers’ Market Offerings: We’ll be attending the Urbana Market at the Square this Saturday, September 23rd. We still have our special dried tomato chevre and a few containers of feta available. Angel Food is still on vacation, but will be back in the line- up next week. Delight Flower Farm Retreat on the Farm There are still spots open for this all-day retreat at the farm, hosted by Delight Flower Farm, on Saturday October 7th. Activities include: yoga, a plant walk, a farm tour, flower arranging, an herbalism class, an introduction to Ayurveda, campfire rituals, and plenty of time to take in the healing properties of nature. Local-farm-sourced and professionally prepared meals are included. Here's the link: http://delightflowerfarm.com/natural-medicine-a-farmstead-retreat/ They have drastically reduced the price of this event to sweeten the pot. You’ll be in great hands with these talented women--you'll be so relaxed and refreshed, you probably won't wont to leave the farm! Farm Dinners: We still have tickets available for the “Celebration of Squash” farm dinner from guest chef Nicole Pederson (Found Kitchen). She has crafted a menu that truly captures the delicious diversity of the family Cucurbitaceae. You won’t want to miss it. We also have tickets to both seatings of the October 14th “Pizza Night Out” dinners-more casual fare. Check them out too.